Jones has a chequered past when it comes to injuries. 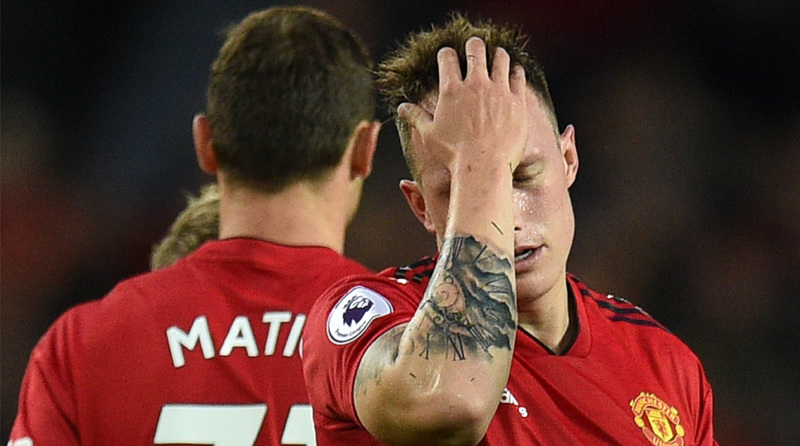 With Manchester United in deep trouble in their Premier League tie against Tottenham Hotspur as they trail 2-0 with little over half an hour to go, their precarious situation was further complicated with an injury to England defender Phil Jones. The injury-prone Jones, in his first start of the season, appeared to have pulled up his hamstring and immediately signalled to the bench to be replaced. Swedish defender Victor Lindelof replaced Jones in the 58th minute with United staring defeat in the face. Usually, a hamstring injury takes anywhere from a week to two months for full recovery and tests will tell the full extent of the issue. Needless to say, the England international will not be taking part in the upcoming international break. Goals from Christian Eriksen and Lucas Moura have Spurs on the brink of a historic win at Old Trafford. Should they hold on for the win, they will be level on points with the likes of Chelsea, Watford and Liverpool at the top of the Premier League table. For United, however, it looks quite grim and if media reports are to be believed, this could be the final straw for the club board with regards to Jose Mourinho’s tenure. Former Real Madrid coach Zinedine Zidane has reportedly been approached and could be given the job by the time the oncoming international break concludes. Apart from Jones and young Portuguese defender Diogo Dalot, United do not have any other players on the treatment table although several of their stars are not yet fully fit after their exertions at the World Cup.